Abu Dhabi: The International Fund for Houbara Conservation (IFHC) has rolled out an alternative classroom programme to engage UAE school students in the importance of conserving and protecting the vulnerable bustard, which is a mainstay of the UAE wildlife. IFHC is the global leader in proactive species conservation that oversees one of the world’s largest multi-region conservation projects to increase wild populations of the houbara species in its natural habitats. After IFHC’s education programme piloted in seven Abu Dhabi schools last year, the implementation of the alternative classroom programme in cooperation with the Ministry of Education (MoE) and Abu Dhabi Department of Education and Knowledge (ADEK) has begun for students from kindergarten to grade 12 at Al Huiteen School in Liwa, said a press release issued on Sunday. 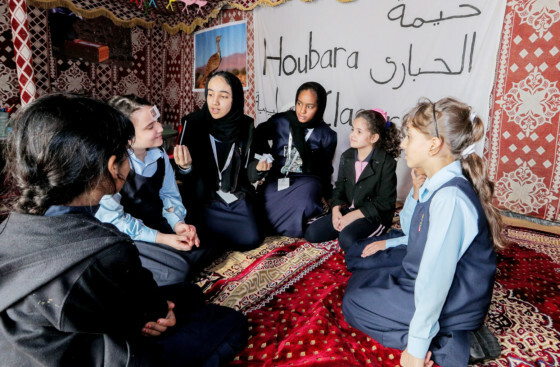 A cornerstone of IFHC’s wider Houbara Model National Programme, the alternative classroom programme will ultimately engage every student in UAE classrooms. Before its countrywide roll-out, Al Huiteen School has erected an outdoor houbara-themed tent for its second term, where activities from the educational houbara handbook are being taught. Students from different grade levels are already collaborating to build a real-life houbara habitat. The alternative classroom implementation follows years of specialist research that suggests that simple adjustments to classroom layouts can have a radical impact on students’ performance and their interest in topics taught. “Inquiry-based learning within an alternative classroom setting puts students more in control and increases their capacity to learn from their own actions, decisions and choices,” explained IFHC’s managing director, Majid Ali Al Mansouri. The programme assets include introductory videos that feed into the houbara handbook, a dedicated website and a tracking-themed gamification element to support the learning experience, while subjects such as science, maths, geography and social studies will be taught. The teaching materials and online resources, which are available to all UAE-based teachers, have been customised to reference the houbara species’ relevance to the UAE culture and heritage. “Al Huiteen school has nominated approximately 20 students from various grades to work as Houbara Ambassadors. These student leaders will work with their peers from junior years to add further weight to the collaborations between students,” added Al Mansouri. As part of the alternative classroom programme, an IFHC field researcher from the Fund’s National Search and Rescue Centre has engaged Al Huiteen students in an activity which allows them to get to know how field researchers work and how to use tracking equipment.